No job is beyond our team of professionals. We quote competitively, and all our work is carried out by professional experienced gutter cleaners with full insurance. Relieve the worry of water causing internal problems by making sure your gutters are clean. Have your gutters doing what they are supposed to be doing – allowing water to flow from your roof to the gutters and then away via the downpipe. 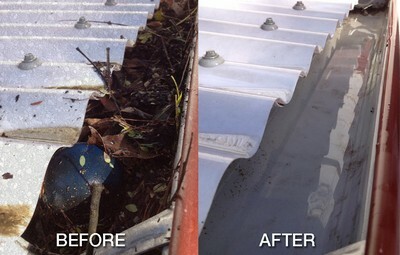 Blocked gutters, caused by leaves and silt, can create internal problems that you would rather do without. Our gutter cleaning service provides the removal of all leaves, silt or debris from external gutters so that they do their job. And then the worry that you experience when it rains is removed, knowing that your gutters and downpipes are working as they should be. No one likes the look of gutters filled with leaves or grass and weeds growing out of them. If this is what your gutters look like then get these handled so that it doesn’t detract from your otherwise beautiful property. Lesters gutter cleaning service is a professional service whereby the gutters are hand cleaned, meaning that what is in the gutters is removed by hand, making sure that nothing is left in the gutters. This solves the problem of overflowing gutters, blocked downpipes and the worry of any internal damage caused by an excess of water in your gutters.